The first thing to do as part of the registration process for narTcert is to join the NAR. Go to the membership page and create an account. Be sure to check the ‘teacher’ box. When you receive your NAR number go to the narTcert Registration Form page and complete the registration form. You will receive a NARTS coupon for a free copy of The Handbook of Model Rocketry. After you are registered, begin learning the online technical material as given in the links. Read through the material and watch the videos at your own pace as there is no time limit on going through narTcert. You can work on this as long as you have a current NAR membership. Study and learn the technical rocketry and learn science education material given in Sarradet’s STEM Model Rocketry Curriculum You can learn about rocketry from many sources on the NAR Educator’s page that are good and worth browsing, but this single source will cover the primary material. As you are learning the material you need to be considering what kind of lesson you want to teach with your launch. There are several sample lesson plans here narTcert lessons samples online you can follow, or see some in the STEM Curriculum. There are lesson plans from Estes or you can find other plans or make up your own. Just be complete in making it a real lesson like you would present to a class. Choose what grade level of lesson you want according to what level you teach. Making a lesson will be simple for professional teachers but those informal educators who are less acquainted with the structure can borrow from the samples. The point is to teach something with the flight and not just shoot a rocket. The lesson will also determine what kind of rocket you will build. When you select a lesson, also select a rocket kit and acquire it, or pick a design and get the parts. It should not be a prebuilt ‘ready to fly’ model. Building the rocket will teach you many of the topics covered in the technical material and you will understand how easy and fun it is to learn. If you select a lesson that would have multiple flights, you need make only one flight to demonstrate the principle and become certified, but fly your rocket as needed to make the lesson work. Complete your lesson plan and send it with or on the Lesson Plan Submission Sheet to education@nar.org. The plan will be evaluated. If the plan is complete, NAR will approve it and send you your Certification Flight Form. After you’ve covered most of the rocketry material, you may begin studying the test questions. The exam will be twenty multiple choice questions taken from this pool of study questions. You will take and pass the test online before you make your flight attempt. When your rocket is built and you and your lesson are ready, contact your NAR observer to plan your launch. Hopefully there will be a NAR launch at a field you can attend, but if not, the NAR member can help you find a place to fly. They will watch you as you prepare, launch and recover your rocket and then sign your Flight Certification Form to complete your narTcertification. 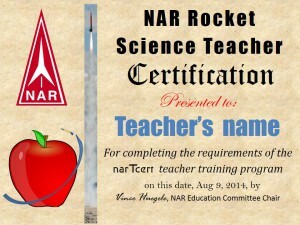 The form will be sent to NAR and you will be added to the list of certified rocket teachers. The NAR will award you a Certificate of Completion with your name. This program administration by a senior NAR member to certify the teacher is meant to be as simple as the Level Two High power certification or a TARC flight qualification. Any adult NAR member can do this who will take the time to handle the paperwork and advise the teacher on how to learn to fly. Ultimately members who are narTcerted themselves will subsequently certify other teachers for the most effective training. 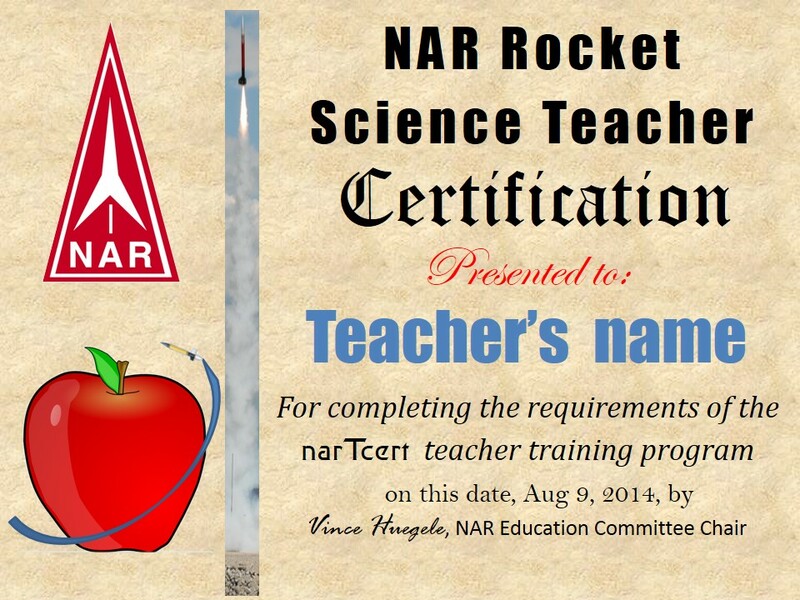 It is NAR’s charter to train others to use rockets safely and for education which is best done by the local members serving in their community. The teacher attempting certification must build the rocket that they wish to use for their certification attempt. The model may not be a RTF (ready to fly) rocket but should be a simple beginner kit with streamer or parachute recovery powered by a NAR certified motor. Water rockets are not applicable. 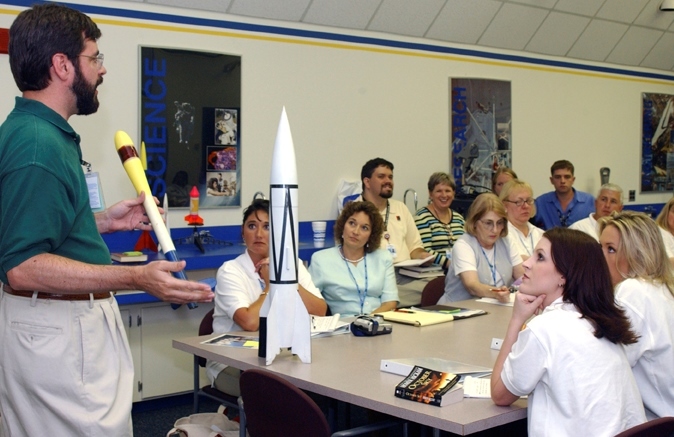 Before a launch attempt the teacher must have their lesson plan approved by the NAR Education Committee. The NAR observer is not appraising the lesson, but only the rocketry procedural and technical aspects of the launch. The teacher will be sent a flight form that they will present to the observer to complete. Before a launch attempt the teacher must also have passed the online narTcert test. They will know their score as soon as they complete the test. The teacher must demonstrate their ability to fly the rocket. They will prep and load the model and ready it on the pad. The model will be subjected to a safety inspection prior to flight where the teacher will be expected to provide general answers to technical questions related to the safety and construction of their model. The teacher will provide the Teacher Certification Flight Form to the NAR member witnessing the flight to complete. Follow the instructions on that sheet and check the ‘yes’ boxes as they are completed. A flight is considered successful if the model flies safely, is returned and could be flown again without major repair as with any NAR ‘qualified flight.’ The flight must be witnessed by the certification NAR member who will sign the certification sheet to indicate that the attempt was successfully completed. The completed sheet is returned to NAR Education by scanned it into a file and emailing, or postal return of a printed copy. In the event that the flight is unsuccessful, the teacher can make corrections or repairs and fly again. Another rocket can be used if the teacher has also built it. There is no limit on the number of flight attempts or when they are made; they can keep trying until they get it right. If the teacher is already certified at any level of high power rocketry, they need not take the written online test but still must complete a flight with a lesson. Check their NAR membership card to verify their active level. Certified teachers will be listed on the NAR website by NAR number for verification in a similar manner as HPR members are posted to recognize them for privileges. They will also have T CERT on their membership card by their NAR number.